There was, of course, an air of inevitability about this match; Kent’s T20 season started terribly, flickered momentarily, before being finally extinguished. Last night’s match, the final home game of their 2013 campaign, felt like trying to reignite a candle with a box of damp matches. With the mother in law available to look after our daughter, I made a last minute decision to go along to the game with my wife, who, whilst understanding of my sporting passions, would probably have rather I spent the £50 taking her out for dinner. After just a few overs of Kent’s innings, I wished I’d taken her out for dinner as well. 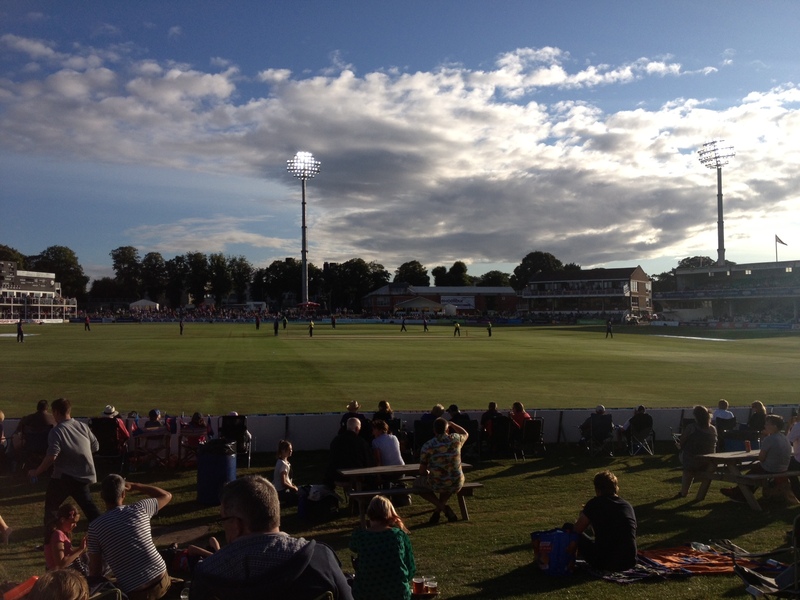 We did have some reason for hope, as her only other visit to Canterbury this year was the genuinely marvellous YB40 clash against Sussex, where Kent chased down 337 to win a game that most of the crowd (myself included) had written off within the first 10 overs of Sussex’s innings. The sad truth though, is that Kent are an average team, playing below average cricket. They are at least one top batsman and bowler away from being anything like good enough to challenge for honours. Their bowling attack, weakened even further now that Vernon Philander’s (fairly forgettable) spell with the club has finished, simply had no answer to a player of the quality of Michael Carberry, who scored a fine 83 off 56 balls, helping Hampshire to 185/6. Kent’s reply never really got going. Their promising, but inexperienced opening partnership of Bell-Drummond and Cowdrey could only muster 12 and 13 respectively. Cowdrey, in particular was disappointing considering the impressive start he’s made in his senior T20 career. Only the evergreen Darren Stevens ever looked like trying to make a game of it, reaching 39 before edging a shot to fine leg off the bowling of Liam Dawson, who would go on to take 4/19. After watching Carberry and McKenzie stroking the ball around confidently and finding the boundary regularly, Kent’s batting performance looked stunted, with too many mistimed and mishit shots and, Stevens excepted, very few boundaries to cheer. After Stevens departure Kent’s batting fizzled out and in the end they could only manage 123/9, 62 runs short of the target Hampshire had set them. It is perhaps not fair to compare them directly to a side as proficient as this Hampshire team, but Kent’s only hope is that their crop of promising, but as yet unproven young players continue to develop as the club hopes they will. They are going to have to play the long game, as I doubt their financial position will allow them to strengthen the squad significantly in the short term. Having said all that, a summers evening sat on the mound on the Old Dover Road boundary is still a pleasant way to spend your time. Despite Kent’s poor season, there was a respectable crowd in and a legion of excitable kids, who, even when they are knocking your beer over and standing in the way of your view, remind you that T20 cricket might not be for the purists, but it does, realistically, remain the best hope for attracting young players to the sport. This entry was posted in County Cricket and tagged Canterbury, Carberry, Cowdrey, cricket, ECB, Hampshire, Kent, sport, Sports, Stevens, T20 on July 30, 2013 by Stumped. Looking like Hampshire have a very decent chance this summer, we’ve built a good side.